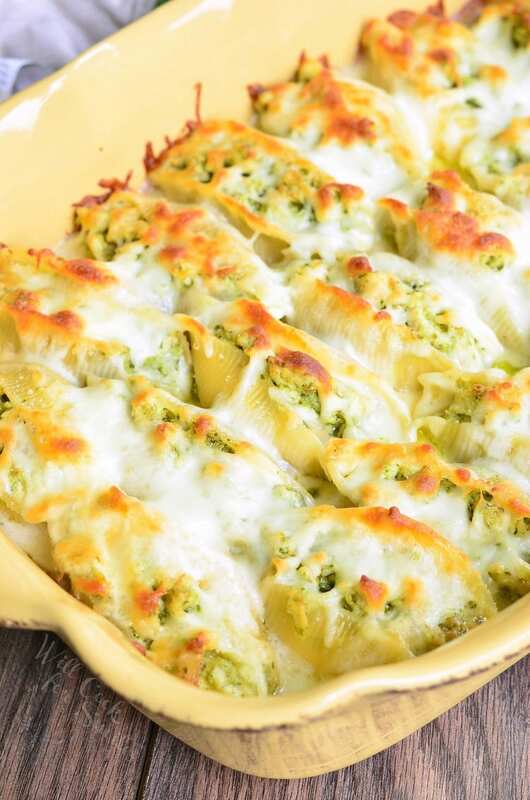 This ravioli mac and cheese is THE ultimate comfort dinner. 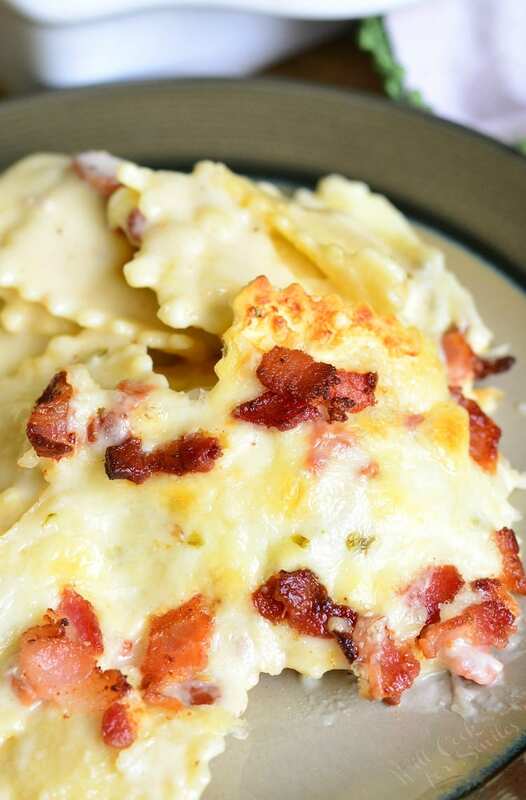 Three cheese ravioli is coated with heavenly cheese sauce, mixed with bits of crispy bacon, and baked to perfection. 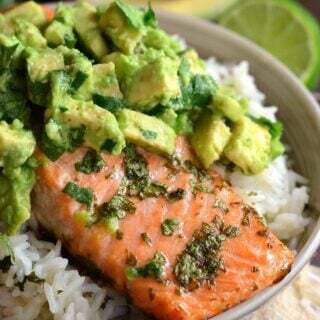 So much flavor and comfort packed into one tasty dish. 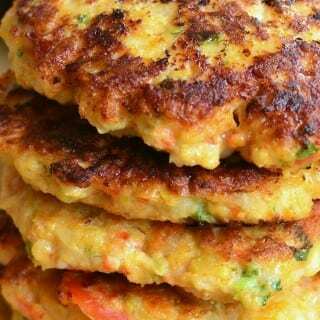 Season of warm, comfort food is upon us. Are you as ready as I am? My family is definitely ready. Hubs came home from work the other day and asked me to make a pasta dish. He has been doing great trying to eat healthy and he definitely misses pasta, especially one that is coated in cheese or some sort of cream sauce. For my husband, pasta makes the best comfort food. I actually always found mashed potatoes and gravy to be the best comfort food (and if it’s homemade demi-glace instead of gravy, then it is pure heaven). Per hub’s request, I decided to throw some of his favorite things into one pasta dish. 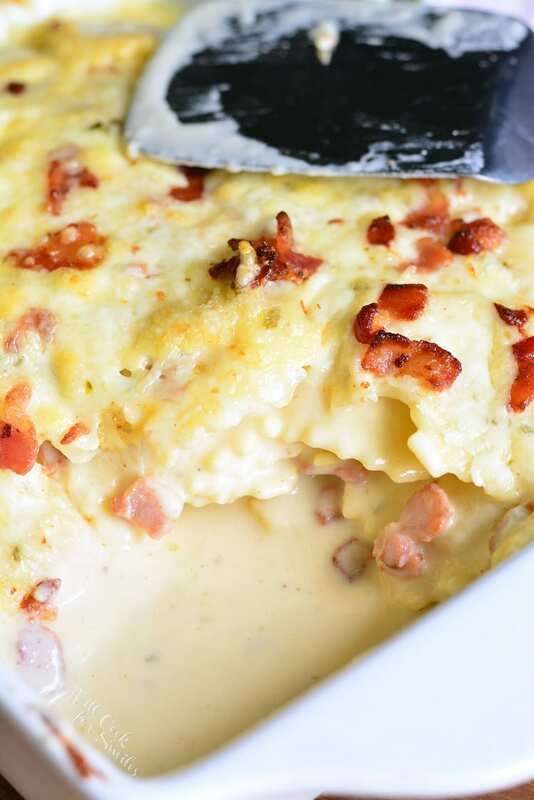 Pasta made with creamy cheese sauce and of course, bacon. Taking it to the next step, I substituted pasta for ravioli. Talk about taking mac and cheese to the next level! 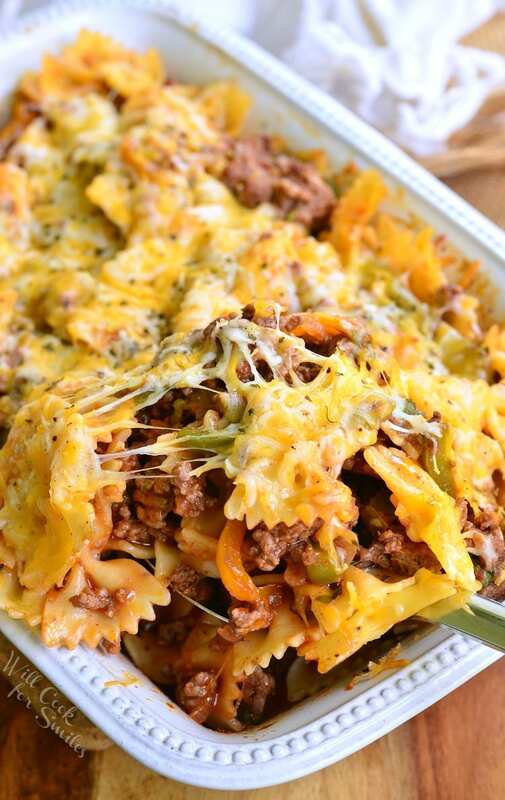 Sometimes you just need to take a break from healthy eating and indulge in a comforting, cheesy, pasta dish. Did I mention cheesy? This cheese sauce is amazing. Believe me, you will want to swim in it! Use a spoon when tasting the sauce because you will want to take quite a few test tastes. 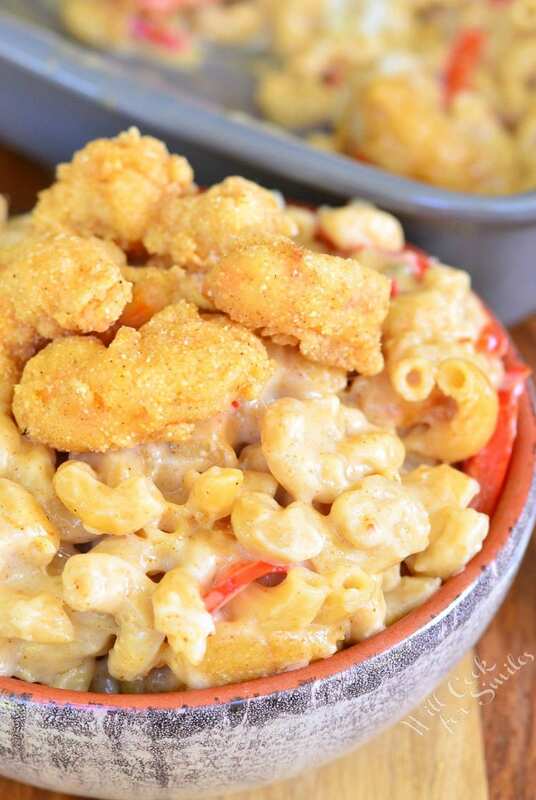 This mac and cheese is not lacking in flavor in any way. 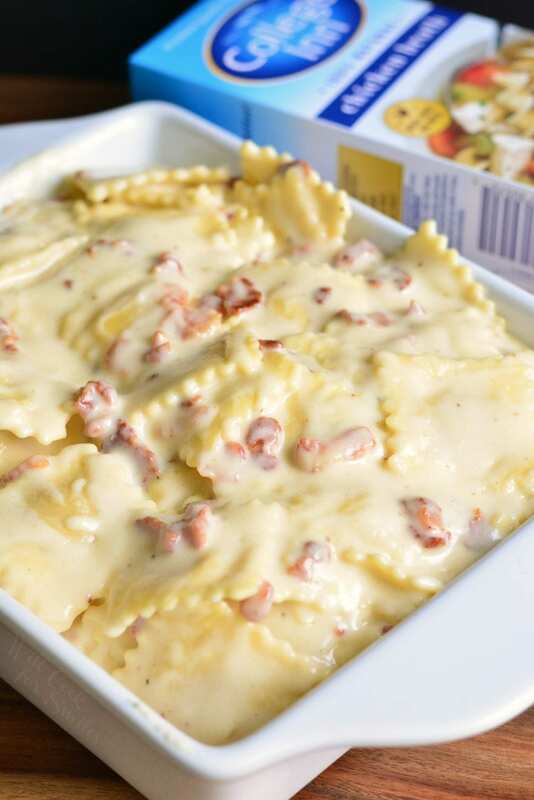 As a matter of fact, it is full of flavors from bacon, a combination of two cheeses, a little spice from using pepper jack cheese, and cooking ravioli in College Inn® Chicken Broth. 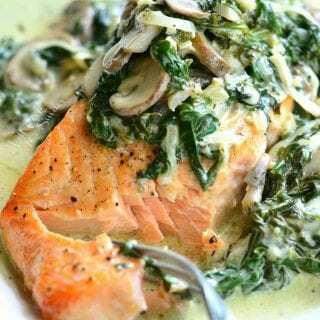 Did you know that you can add much more flavor to your rice, quinoa, and pasta dishes by cooking it in broth or stock? You should start using broth instead of water immediately if you haven’t tried it yet. It truly elevated the dishes to a new flavor level. I also use broth to cook potatoes when preparing mashed potatoes. Don’t forget to save some of the broth after cooking pasta for sauces and gravy. College Inn broth is always the perfect choice for richer flavors. I have one more tip for you before I let you go make your own ravioli mac and cheese. 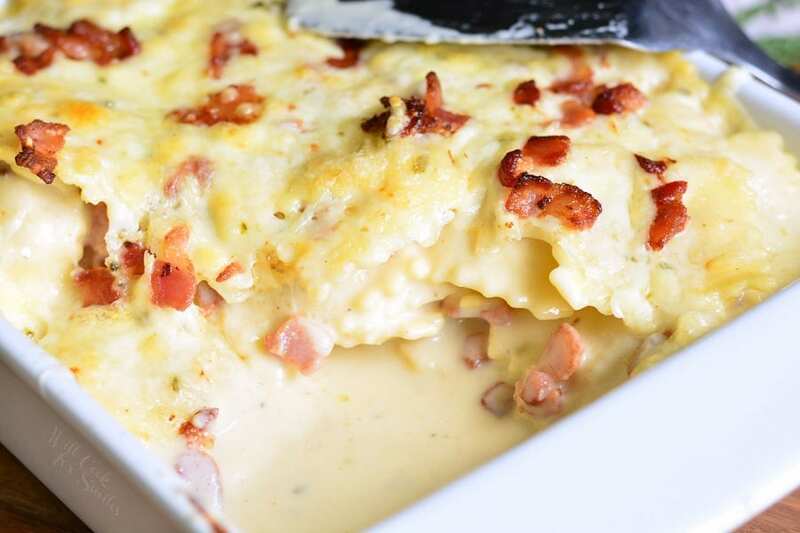 For best results in preparing this cheese sauce, I recommend using block cheese over already shredded cheese. Freshly grated cheese from the block melts better and results in a smoother, tastier sauce. 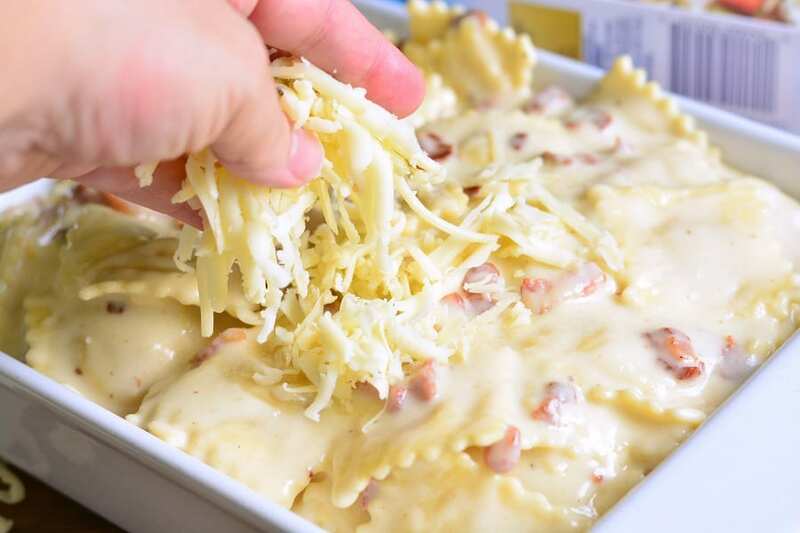 Shredded cheese is usually mixed with corn starch and other ingredients to prevent sticking and it will be all added to the sauce with the cheese. 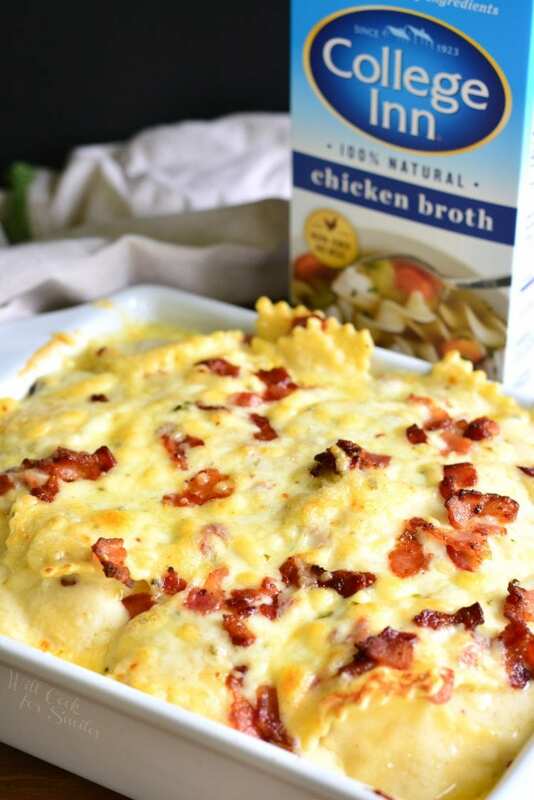 If you try out this recipe, share the results on social media using #CollegeInnBroth! 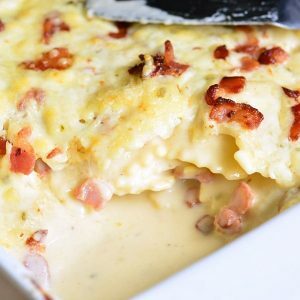 Three cheese ravioli is coated with heavenly cheese sauce, mixed with bits of crispy bacon, and baked to perfection. Preheat oven to 350 and lightly grease a 2-quart casserole dish. Bring chicken broth to boil in a large pot and season with some salt. Add ravioli and cook until just done. Drain off broth but make sure to save some for the cheese sauce. 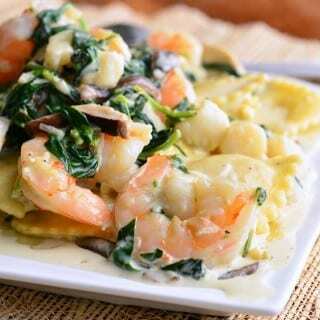 Set ravioli aside. Dice bacon into small pieces and cook in a medium pan, over medium heat, until fully cooked. 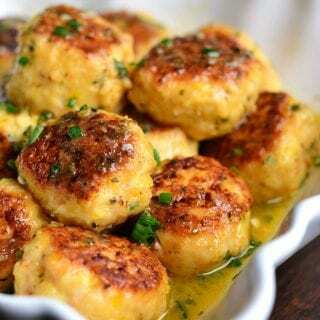 You can use some of the bacon fat to make a roux for the cheese sauce. Discard remaining grease. Set aside cooked bacon pieces. In a sauce pot, over medium heat, combine saved chicken broth and milk. Mix and bring to simmer. Make a roux by mixing flour and bacon grease until it forms a paste. Mix the roux into the milk mixture. Add both grated cheeses to the sauce pot while slowly stirring. Season with a little bit of salt but don’t overdo it because bacon will also add some saltiness to the dish. Keep slowly stirring until the mixture is smooth and thickened. 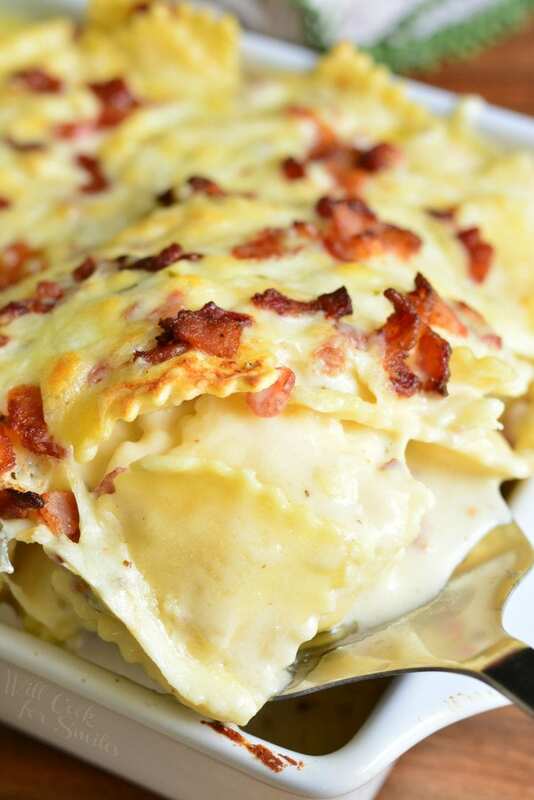 Mix ravioli, bacon, and cheese sauce until everything is evenly coated with sauce. Transfer the mixture into the prepared baking dish. 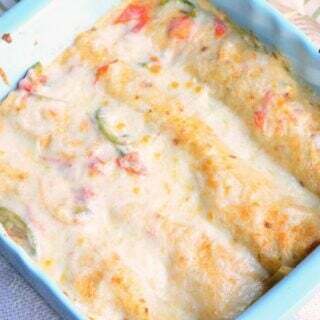 Sprinkle some more cheese on top and bake for about 10 minutes.